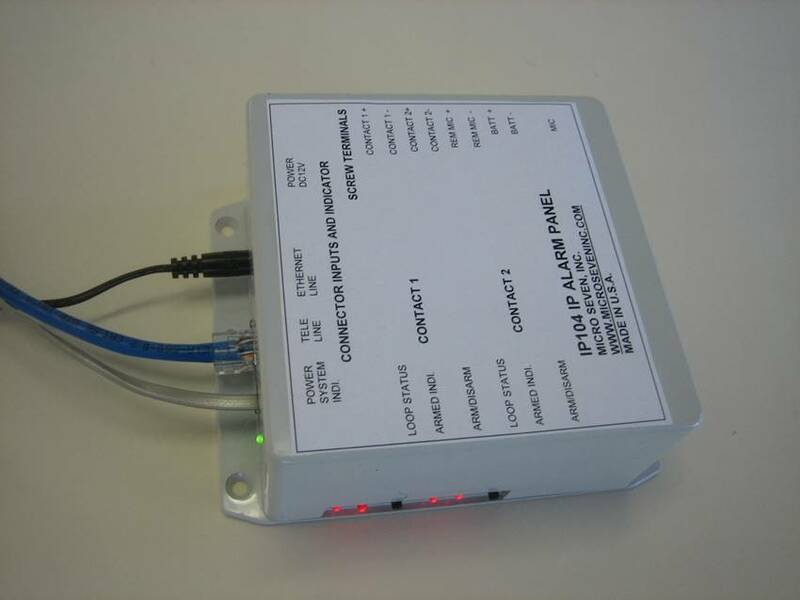 ­­­Micro Seven Inc.® IP Alarm Panel model IP104 transmits IP alarm messages and emails via Internet with telephone line interface for transmitting Contact-ID message. Alarm inputs include both loop inputs and microphone input. The IP104 is shown in the above picture with Ethernet connector, telephone connector, power connector, loop inputs on screw terminals, microphone, arming/disarming switches, loop status and audio speaker. -local or remote access to IP104 for arming/disarming, all programming changes, loop status, event reported conditions, and start test sequences. PC with demo server by Micro Seven, Inc. The above diagram shows an interruption of either loop input 1 or loop input 2 is reported to an IP server or ER15, to your email receiving box, and to an alarm central station or LS15E/LS15F. Microphone input may replace loop input 2 for detecting excessive audio level. 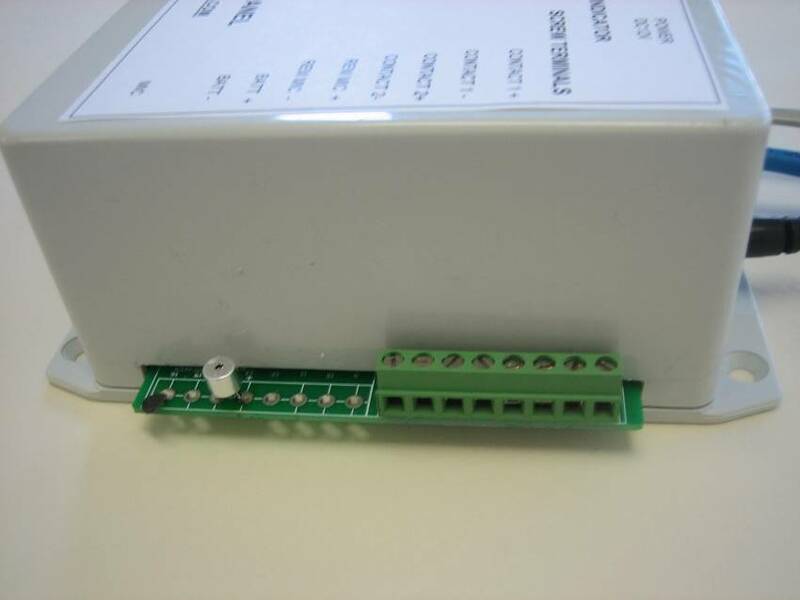 Micro Seven, Inc. model IP104 contains Ethernet or Wi-Fi interface and telephone line interface to send ANSI/SIA DC-09 formatted digital alarm messages to digital alarm receiver servers and Contact-ID messages via telephone line to alarm receiver. IP104 also sends email to any email addresses via your SMTP server. Setting up server IP addresses, port addresses, receiver numbers, loop input, microphone function, central station’s telephone number and other parameters are programmable via network. Excessive audio input may result in listen-in sequence via telephone line to alarm receiver or Micro Seven model LS15E/LS15F. Status of IP104 may be monitored by using provided Windows control software or programming of IP104 may also be accomplished. Two pictures above show Programming of IP parameters including server IP address, server port number, types of IP messages, DDNS parameters for DNS updating, email parameters including to address, from address, name of email server, password, time zone information, email formats are provided by browser-based software. Alarm loops, sound input, alarm restore period, alarm set-up delay, entry pre-alarm period, sound detecting level, siren period, siren modulation frequency, types of alarm messages for loops. When the menu in the software, “starting IP message then Contact-ID message” is selected, IP alarm message and email messages are sent first, then Contact-ID message is transmitted over telephone line. Otherwise, Contact-ID message is sent over telephone line first then IP message and email messages are sent over Internet later. Excessive voice triggered alarm condition originates one-way voice communication between IP104 and telephone set. Event reporting at IP104 is transmitted to one or two alarm receiver/server CSR as TCP-Server. Time stamp data from remote SNTP server is translated to UTC(UK time). Transmission priority between IP and telephone reporting is selected by control software. Emails with the following sample texts are sent to multiple email addresses directly from IP104 without any PC involvement. This is an automated E-mail, Do not reply. Programming of email parameters using our provided software includes “to address”, “from address”, your SMTP server name, user name, password, and subject field. Please use your non-SSL SMTP server. Each email may be repeated twice. 1. Automatically send test messages periodically to IP servers for repetition rates, which is set for a number of seconds by the programming software IPPROG2.EXES. Typical repetition rate may be for sending IP test messages to IP servers. 2. Manually send IP messages to IP servers, send emails to multiple email addresses, and send standard Contact-ID message with event code of 601 after dialing central station’s telephone number. In case of no central station, it can dial your voice telephone number and creates listen-in setup with on-board microphone. Voice channel from you to IP104 may be switched on after push “2” on your telephone set, and you can switch back the listen-in from IP104 after push “1” on your telephone set. 3. Identical test sequences for IP servers, email addresses and telephone line features may be started automatically by starting test sequences on the hour for each two hours like 08:00, 10:00-----, 16:00, 18:00, etc. Sending test messages to email addresses using your SMTP server also check your SMTP server and email receiving capabilities. History file in non-volatile memory of IP104 with all transmitted contact-ID messages with time stamp is obtained by locally or from remote location. Its format is (contact-ID message) plus (time of day in UTC/GMT). Free proprietary DC09 software is included. The provided software also allows remote arming/disarming of two loops or one loop and voice detector instead of using switched on IP104, and monitoring loop status, displaying microphone voice trigger setting, alarmed condition. By using Dyndns updating inside IP104, dynamic name resolution is implemented for IP104. Then host names from Dyndns may be entered for IP104 instead of dynamic or static IP address. Built-in microphone and speaker: Microphone is used as a sound detector and also as talking path for listen-in for telephone circuit. Speaker is used for siren and warning sound and voice communication for listen-in over telephone circuit. Maximum sixty alarm messages with time stamps are saved in EEROM inside IP104. History files may be uploaded to a PC file. 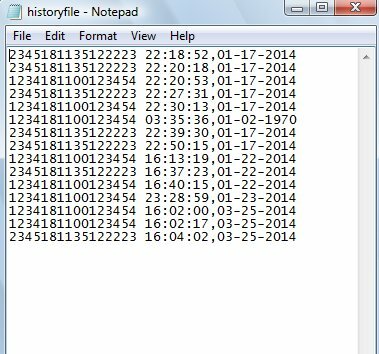 Sample history files are shown below with Contact-ID alarm message with time stamp data that includes hour, minutes, seconds, month, day, and year. IP104 is connected to SNTP server to obtain the UTC(GMT), UK time. If there is no Internet available for real-time stamp data, estimated time stamp is available. 1095-K N.E. 25th Hillsboro, OR 97229 U.S.A.